As you can see with the logo on the current page and will see when launching the new version of FastRawViewer, we've changed the program icon and updated the logo. There is no full support for transparency and alpha channel, because FastRawViewer is a tool for photographers, not for designers. RGB/RGBA: 8/16 bit integer, 16/32 floating point (normalized to 0-1, though we haven't yet seen any other FP normalizations). Grayscale: 8/16 bit integer and 16/32 floating point. LAB (CIELAB TIFF): 8/16 bit integer. CMYK: 8/16 bit integer (very basic support, see below). As well as a few other formats (hasn't been fully tested yet): palette, inverted grayscale. Photoshop TIFFs with built-in layers: what is displayed are the composite previews (full-sized) created by Photoshop, information about the layers is ignored. Compression methods: standard TIFF (Uncompressed, RLE, LZW), Adobe Deflate, Deflate. Color data: both ICC/ICM profiles and Primaries/WhitePoint/Gamma are read and displayed (if Gamma is absent, gamma is considered to be = 2.2 for integers and 1.0 for floating point). Attention: LAB-tiff previews are stored in the preview cache (see below Thumbnail cache section) in RGB format. If you change the color space for thumbnails, then the old previews will be displayed inaccurately; we recommend using Menu - File - Reload - Clear thumbnails cache (unfortunately it is currently impossible to remove only the previews for LAB files from the cache). TIFF files: EXIF is extracted and displayed. BigTIFF: EXIF not extracted/displayed, no plans to support it until several/many users will request it (with image samples). PNG: EXIF extracted and displayed, but there are format limitations: it is not possible to extract EXIF from PNG without (slow) full image unpack. So, sorting by EXIF date is not possible for PNG files. TIFF/PNG files do not have any ratings/labels (they aren't read; they can't be applied). Rotating TIFF/PNG files in FRV is not supported; for TIFFs, the Orientation tag is read, while PNGs have no such tag. The corresponding menu elements/actions (XMP rating, XMP label, rotate) are inaccessible for TIFF/PNG files. 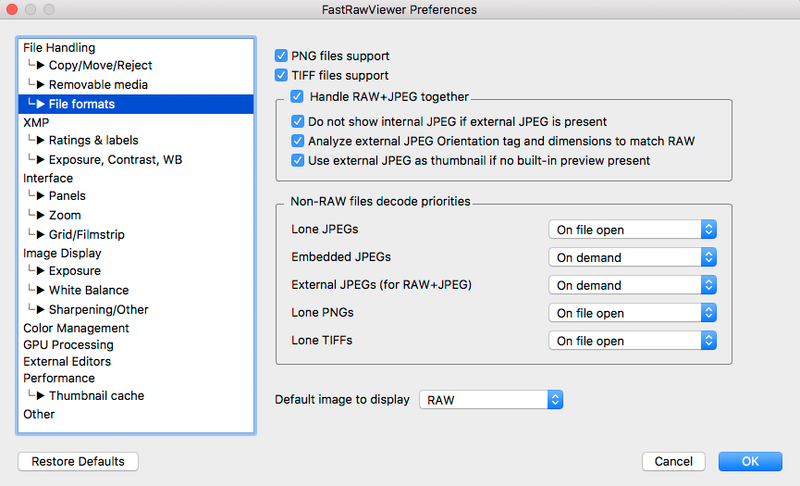 Mac: Menu – FastRawViewer – Preferences, or "Command+,"
Windows: Menu – File – Customize – Preferences, or "Ctrl+P"
The Preferences - RAW+JPEG section has been renamed to Preferences - File Formats, the new display can be seen below. PNG files support and TIFF files support checkboxes. Turning them on automatically adds *.PNG and *.TIF/*.TIFF to the list of accepted extensions. On prefetch - the file is decoded in advance. Support for TIFF and PNG is on by default, the On prefetch mode for these files is on by default if the computer has more than 14GB of memory. For files having TIF extension, we detect if it is a TIFF or a RAW TIF automatically (some early cameras, including the first ones in Canon 1D series used .TIF extension for raw files). TIF/PNG files do not form a pair with JPEGs (even if those TIFs were RAW files from Canon 1D, but those cameras were not offering shooting in RAW+JPEG mode as far as we remember). Because TIFF/PNG files can be any size (whether in bytes or pixels), we had to put in a few customizable limits. For displayed files (PNG files size limit, TIFF files size limit). If the file size is larger, then FRV will not display it; increase the limit if you need to. Files, for which previews are generated (PNG/TIFF thumbnail generation limit). If the file size is larger, then instead of a preview an "Dimensions too large" icon will be previewed. Aside from this, in the Other performance settings group, a new Generate high-quality thumbnails setting has been added. Turning it off will make the quality of the previews lower, but they will be created noticeably faster. To support various TIFFs created by film scanners, we have added hidden (meaning that they are not set through the Preferences dialog) settings, explained below. 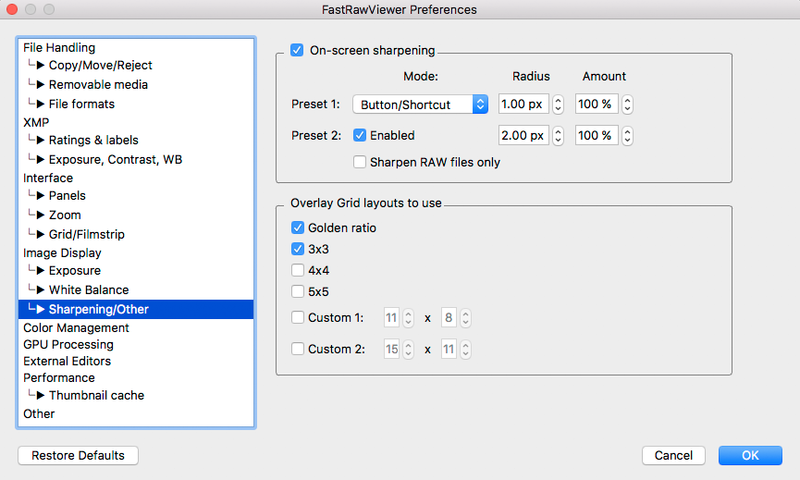 Just in case, we would like to remind you that these settings are set through the registry (Windows) or the defaults (Mac) and become effective when FastRawViewer is relaunched (it's better change these settings while FastRawViewer is closed). AdditionalTIFFExts - an additional list of extensions (other than *.tif *.tiff) that are interpreted as TIFFs. to a nice quiet place somewhere, edit it as you like: the list of extensions can be set as *.EXT1 *.EXT2, or .EXT1 .EXT2, or even just EXT1 EXT2, the space is the separator. After that, double-click on the file; Registry Editor will launch and import your setting. where *.fff and . *yyy are those extensions that you would like to be considered TIFFs. They will be tested as to whether "is this RAW?" when displaying or building the preview, so one may safely mix *.fff files from Imacon scanners and *.fff files from Hasselblad (or any other) cameras. 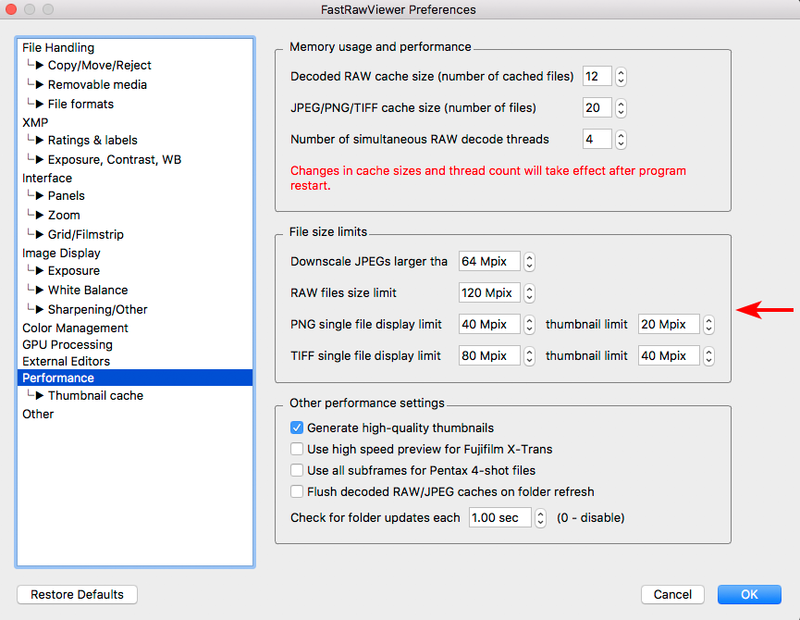 If you turn on the NonBayerTIFFIsNotRAW setting, then FastRawViewer will stop considering TIFFs with "non-Bayer" data to be RAW files, and will consider them to be TIFFs. Complete support for CMYK files is impossible without complete Color Management. In turn, high quality CMYK-RGB conversion is hard to perform fast enough so as to not cause annoyance for FastRawViewer users. Nonetheless, many photographers have large archives of CMYK TIFF files, and we don't want to make FastRawViewer incapable of viewing those archives. The hidden setting TIFFCMYKasGray (toggled through the script: TIFFCMYKasGray/ NoTIFFCMYKasGray) allows the display of CMYK TIFF files. These files are displayed as grayscale, which allows one to select the files for further examining and editing using other applications (for example, Adobe Photoshop), and at the same time solves the speed problem which arises when supporting such files through accurate CMYK-RGB color transforms. Up to and including version 1.4, FastRawViewer built file previews on the fly. This is a fairly fast process for RAW files, and is sufficiently acceptable for very large JPEG files. The situation with TIFFs is different – TIFF files can be hundred of megabytes in size, can be packed (compressed) using an algorithm that takes a relatively long time to do so, and may not contain a built-in preview. If there are many such files in the folder, then viewing/opening such a folder can lead to a lot of time spent waiting for the previews to be built. Because of this, in order to support TIFF files we had to implement a disk cache for previews, which would survive FastRawViewer re-launches. Thumbnail prefetch depth: how many previews aside from those already displayed on the screen will be created ahead of time. Thumbnail decoder thread count: in how many threads they will be built (for HDDs, we suggest lowering the default setting to 2-3, for SSDs the optimal setting is between the number of CPU cores and twice the amount of cores). Thumbnail cache size - how many previews are stored in the memory. Metadata cache size - the amount of files for which metadata (EXIF, XMP, etc.) is stored in the memory. Thumbnail database path - the location of the folder where the cache file will reside. Stored thumbnail size - either the current size (then when changing the size of the displayed previews the cache will become "obsolete"), or the maximum possible preview size (then the cache size on the disk will be larger). Image compression: how exactly to compress the previews being saved. 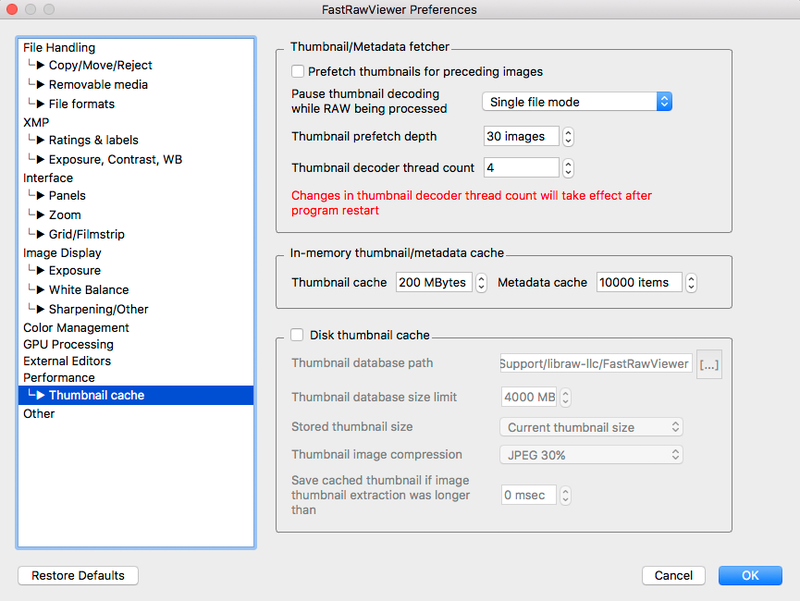 Save cached thumbnails if...: this is the most important setting, only those previews that take a long time to create (correspondingly, rebuilding them each time takes a long time) are stored in the disk cache. If you want to put everything in the disk cache, reduce this setting to zero. If you would like to rebuild the previews for the entire current folder, use Menu – File – Reload – Fetch thumbnails for current folder (Ctrl+Shift+F on Windows, Command+Shift+F on Mac). If the disk cache is turned off, then the amount of previews built will be no more than 80% of the cache in the memory (so 400 out of 500 with the settings on default). If you want to clean the disk cache, use Menu - File - Reload - clear thumbnails cache. Note 1: We do not recommend using large values in Thumbnail prefetch depth for automatic background building of all the previews in the folder, except for in the case of "I have a very powerful computer with a very fast SSD." It's better to invoke a command to build the previews (Fetch thumbnails for current folder) and wait for it to finish. Note 2: When saving TIFFs from Photoshop, we recommend turning on the Save Image Pyramid option: for those files, previews are built an order of magnitude faster (because it is not necessary to read full-size if the file has options of 1/4, 1/16, 1/64...by resolution). New mode Overlay Grid: displays a grid on top of the image display. The grid can be turned on through Menu - View - Grid Overlay - select the desired grid configuration, or via the hotkey Alt-G (Windows) / Opt-G (Mac) (equivalent to Menu - View - Next Overlay Grid). Setting the configuration can be done though Preferences - Image Display - Sharpening/Other tab (previously Sharpening). Available grid configurations: Golden ratio, 3x3, 4x4, 5x4 and two Custom configurations allowing one to set user grids. When creating a custom grid, the first number is the number of marks along the long side, the second is the number along the short side. In EXIF output line of Grid / Filmstrip (to set it up select Show EXIF Data - Image size in "gear" menu). Zoom In range limit: it is now possible to use [ ] Fit Window setting instead of limit in percent. If, however, OpenGL mode was enabled in FastRawViewer version 1.5 (through settings, or via script Start - Menu - All programs....), it will be effective, with no attempts of automatic override to be made. Global _Rejected folder - if in Global Rejected mode. Added _Selected subfolder functionality: it is anti-parallel to the functionality of _Rejected, meant for those shots that are selected. _Selected folder is always a subfolder in the current folder. It is disabled by default, to enable it, set a checkmark in [ ] Enable move to Selected subfolder checkbox in Preferences - Copy/Move/Reject (there you can also set the name for this subfolder). If _Selected subfolder functionality is enabled, the action is added to Menu - File, and to context menus. Channel View/BW View are moved into Menu - View - RGB/Channel/BW submenu. The installer has become noticeable smaller. The version for WindowsXP/Vista does not contain the Usage Tips inside (but you can download the file with them separately), because these operating systems don't have tools necessary to display PDF files. Mac Version: necessarily separated into Legacy (Mac OS X 10.6-10.8) and the standard installer (10.9-10.14). Added support for ICC profiles for monochrome JPEGs (for PNGs and TIFFs as well, of course). The JPEG cache no longer prefetches file as aggressively. The amount of memory used by the JPEG cache has been reduced. Shortcuts: a new section titled 'Folders handling' has been added, and folder operations have been moved there. We would like to state emphatically: this viewer is made for photographers, so we support those formats that are encountered in photographic practice. It is not inconceivable that we will add support for PSD/PSB files, there is a certain desire to add HEIC. But what we will definitely not do: add support for GIF, BMP (Targa, SVG, WebP, JP2 and the other 700+ graphic formats). There are programs that are capable of working with a million formats (without getting into their specificities and details). Please use those. The new file formats are in any case a useful addition even if I rarely need PNG. So far I had no crash, everything works without problems. It seems to me that the display of the photos is a bit faster. Very useful is the possibility to define a folder for "Selected". What was not mentioned at all is that the folder can also be defined for a higher level, for example "../_selected". This is very convenient because I often use sessions in Capture One. I also welcome all the other new features, even though I haven't been able to try everything yet. I also think the new icon is very nice, but I would wish that the small icon of the taskbar would be even more eye-catching (4k screen, 24"). Could you make that a little more noticeable? In the Settings - XMP i cannot deactivate the checkbox for "Warn if overwrite XMP for file with same name" anymore. Maybe there's addictions to that, too. But they should be transparent. In my opinion, FastRaw Viewer now only lacks the ability to assign keywords. In any case: many thanks for the continuous development of this great program. It is absolutely unrivaled (only ExifPro can keep up with it).